I read this to be very interesting, thought it might be something for you. The article is called News and is located at http://www.aproperbakery.com/news/. Enjoy Boulangerie’s Easter Specialties: Hot Cross Buns! Honey Lavender Cake, Lemon Poppy Seed Loaf (gluten free available), Ham Swiss & Spinach Quiche: and Asparagus, Tomato & Parmesan Quiche. To place your order, please call us at (207) 502-7112. Have the best St. Patrick’s Day ever with Irish specialties from Boulangerie. Irish Soda Bread – both regular and gluten free and Chocolate Guinness Cake for dessert! To place your order, please stop in or call us at (207) 502-7112. ‘Tis the season for holiday treats! 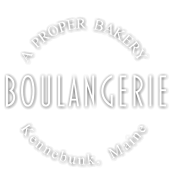 Make your celebration even more festive with Tourtiere, Stollen, Gingerbread Loaf, Quiche, Pithivier and more from Boulangerie – A Proper Bakery. Apple, Pumpkin & Pecan Pies, Pecan Cranberry Rolls, Buttermilk Biscuits, Cake & White or Wheat Rolls – All handmade! Make Dad’s Special Day extra sweet! Boulagerie, A Proper Bakery, is preparing some special desserts in honor of Father’s Day. Choose from Caramel Bourbon Pecan Brownies, Maple Bacon Biscuits or Sugar Cookies. To place your order, please call us at (207) 502-7112. Lemon Cream & Fresh Blueberry Tart, Chocolate Dipped Strawberries and fancy Mom Shortbread Cookies. Order by May 9th.